Cabbage green peas recipe Kerala style is made by cooking and stir frying the cabbage and peas along with coconut and spices. 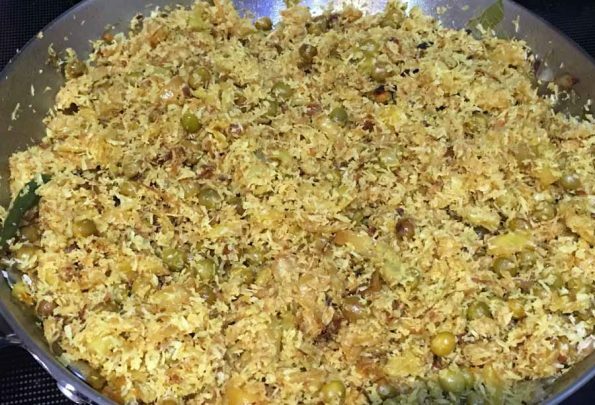 Cabbage and green peas is a very delicious combination and you should try this combination if you have never tried it before. You can see from below image where cabbage and green peas served as a side dish with rice. You can use dry unsweetened shredded coconut if you do not have fresh coconut. This recipe uses one cup of dried green peas, you can also use fresh or frozen green peas instead but you may need to increase the amount of peas if using fresh or frozen peas. If you don’t have fresh or frozen peas, you can easily use dried green peas in this recipe as recommended, just make sure to soak the dried green peas for at least 6 to 7 hours prior to using in this recipe. Even if you don’t have coconut or do not want to use coconut, you can stir fry the cabbage and peas together with a few of your favorite spices and it will taste so good, as the cabbage peas combination is really awesome. You can also add scrambled eggs with stir fried cabbage and peas, as cabbage with scrambled eggs is another wonderful combination. I have a simple and delicious cabbage stir fried with scrambled eggs here which is perfect for breakfast. 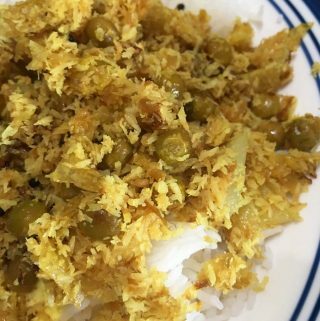 If you like the addition of coconut, do try this combination of cabbage and peas with grind coconut mixture and spices which is very delicious when served with rice for lunch or dinner. This cabbage green peas recipe is a South Indian Kerala style recipe which makes a vegetarian as well as vegan side dish with rice. I also have Kerala style cabbage stir fry or cabbage thoran recipe (without green peas) here. So here is how you can make this easy, delicious cabbage green peas stir fry with coconut following this easy cabbage green peas recipe. Cabbage green peas stir fried with coconut and spices also known as cabbage peas thoran or poriyal in South India makes a very yummy, easy vegetarian/vegan side dish with rice for lunch or dinner. Wash and soak the dried green peas in water for at least 6 to 7 hours or overnight for best result. After soaking, drain the water used for soaking and rinse the peas in fresh water again, keep this washed peas aside. You can skip this step if you are using fresh or frozen peas. Wash and chop the cabbage as thin fine pieces, keep aside. Chop the onions also finely and keep aside separate from the chopped cabbage. Heat the oil in large sized pan or skillet, add the mustard seeds. Add the chopped onions to the pan and saute for about 1 to 2 minutes. Add two green chilies (you can slice them lengthwise) and crushed garlic, stir and saute for another 1 more minute. Add the chopped cabbage and green peas to the pan, add enough salt and stir well all the contents. Saute the cabbage and peas in medium heat for about 3 to 4 minutes, stir well again. Add the water to the pan, close the pan and cook in medium heat for about 12 to 15 minutes or until the peas and cabbage is cooked. Make sure to open the pan in between and stir occasionally and also to watch that the contents are not getting burnt at the bottom of the pan. If needed, you may add a little more oil to the pan, mix well and cover and cook for few more minutes (you may also add little more water if needed). Meanwhile coarsely grind the coconut with the remaining one green chili and cumin seeds. You may sprinkle a little water if needed, but we need to make a coarse mixture so just quickly grind for a few seconds. 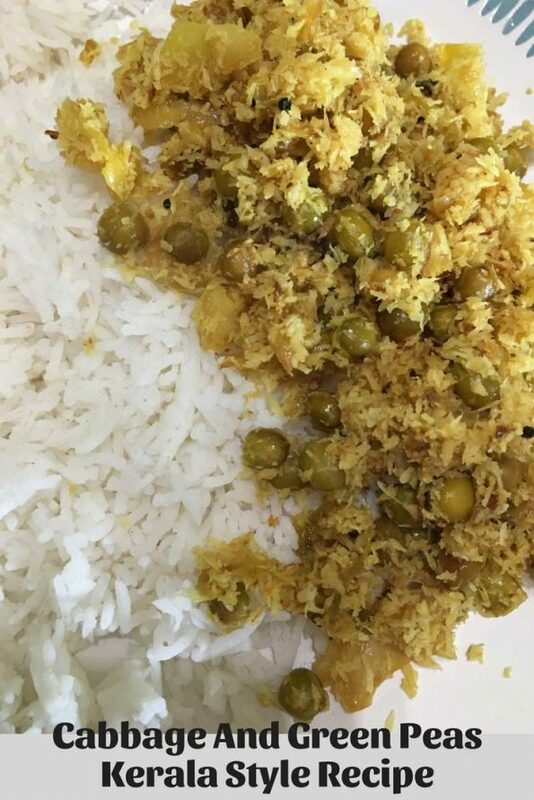 Once the peas and cabbage is cooked, add the grind coconut mixture to the pan and also add the spices - turmeric powder and red chili powder, stir well, cover and cook for another 2 more minutes. Open the pan, stir well the contents and the cabbage and green with coconut and spices is ready to be served. If you wish, you may add an extra tablespoon of oil and stir fry in low heat for another few minutes, stirring frequently, until the cabbage starts turning light brown in color. The additional stir frying will make the dish so much more delicious. Enjoy the cabbage and green peas with rice along with any gravy or fresh yogurt. The best combination with this cabbage peas stir fry and rice is moru curry, pulissery or sambar but you can enjoy it with any curry as you like. 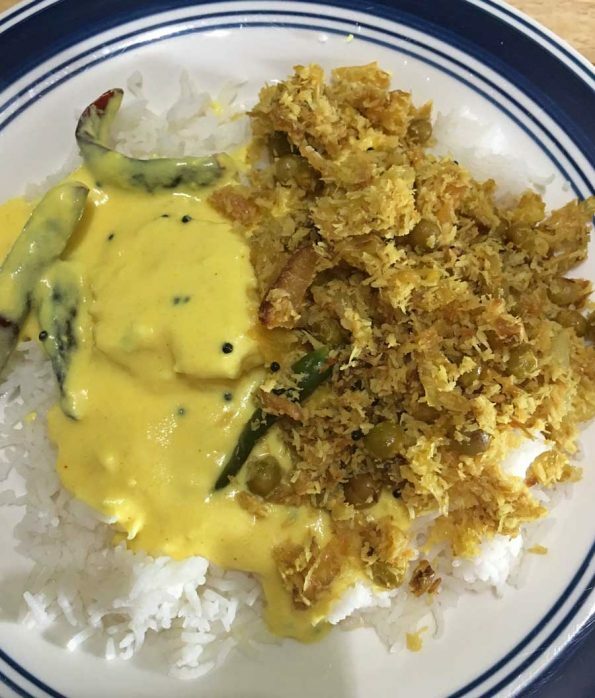 As you can see from the below picture, this cabbage green peas stir fry with coconut and spices is served with rice and easy moru curry (yogurt curry) which makes a simple but awesome combination for lunch or dinner. 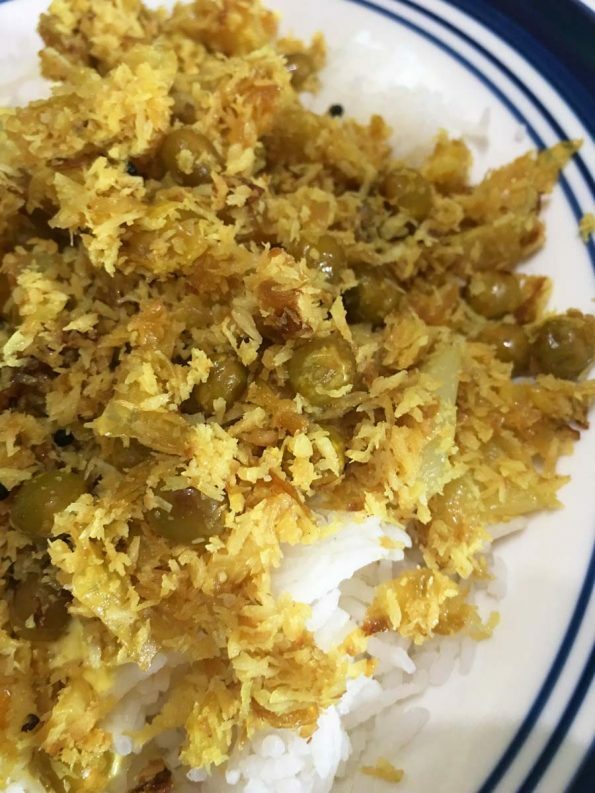 Hope you found this post on cabbage green peas recipe Kerala style helpful in making easy and delicious cabbage and green peas stir fry with coconut and spice.